It’s my dad’s birthday today and this recipe is just for him. Understanding, supportive, hard working and giving, my dad is hands down the most wonderful father a girl could ever ask for. Ever since I was little my dad encouraged me to reach for my dreams – no matter how far out they seemed -while offering me words of wisdom every step of the way. What’s more, he worked tirelessly for over 40 years to ensure that my sisters and I could reach for every wild aspiration we could imagine. We are three very lucky girls. 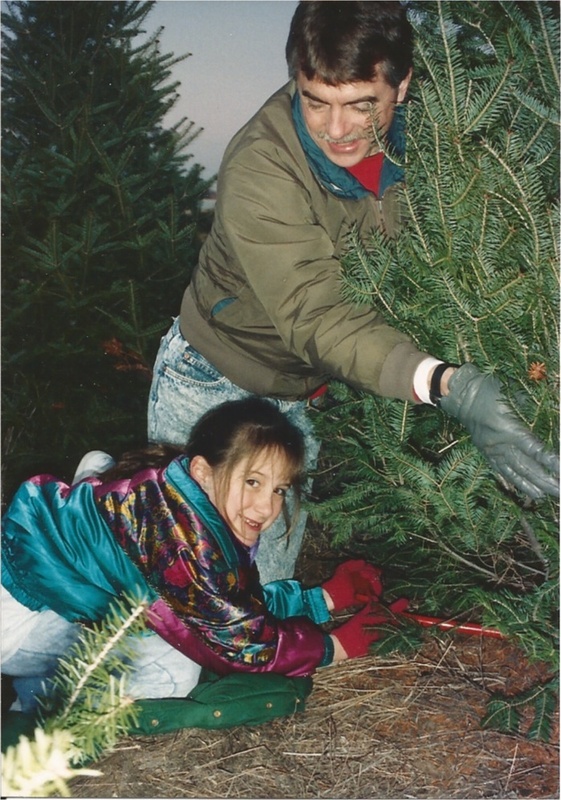 From exiting vacations every spring to sending my sisters and I to camp each summer, my dad made sure that we had memorable, special experiences when we were growing up to help us learn and grow as individuals. It was not just these major experiences that were so special, however. Ever since I was little my dad has been sharing with me his wisdom, from little things like how to tell when the sun will set by counting your fingers on the horizon, or how to properly tie a Christmas tree to the top of your car, to major life hurdles that are entirely too complex to write about here. Dad has been with me every stop of the way helping learn, laugh, and discover. To celebrate my dad’s birthday today I have made some chewy, gooey six minute caramels that easily rival anything from a candy shop. Every winter when I am home for Christmas I go a bit crazy in the kitchen making hundreds of Christmas cookies and candies for the family. Caramels are always on the menu, and if any of you have made traditional caramels before, you know they take quite a bit of work. Well, my dad loves caramels, so that batch of 32 wouldn’t last too long. Luckily I discovered an easy and FAST solution with these six minute microwave caramels. Just like the stove top version but done in a fraction of the time, this recipe is perfect for any caramel lover in your life. 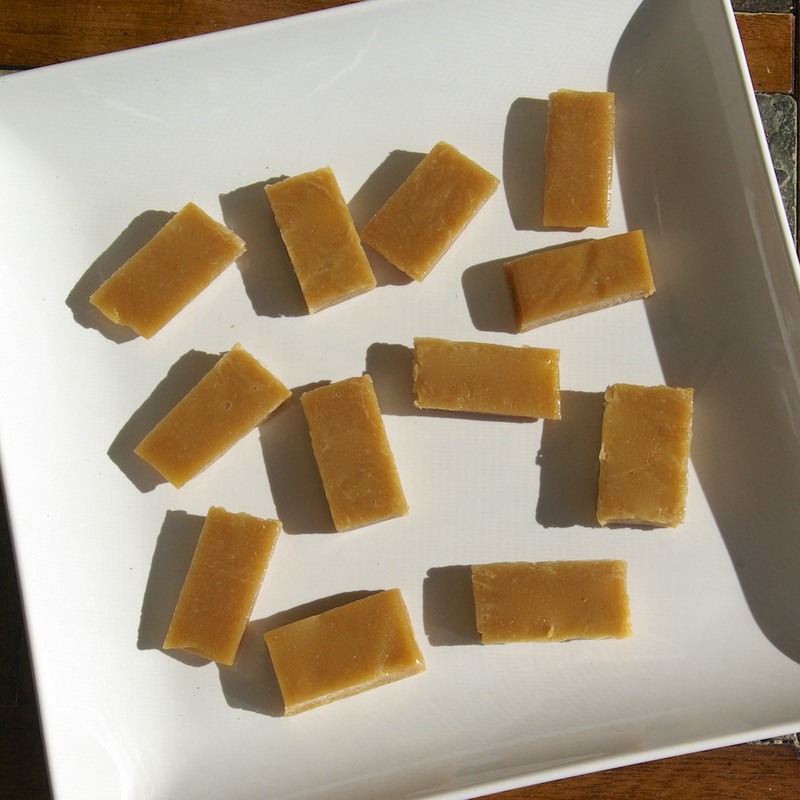 Paula’s Notes: I call these six minute caramels because in my OLD microwave, they were soft and chewy in six minutes. That being said, I just purchased a new microwave last week following a burnt rice fiasco, and now they reach their chewy texture in five minutes; in this new microwave, six minutes creates caramels like the old “Slow Poke” candies (do you remember those?). Both my old and new microwaves are 1100 watts, but I think the “new-ness” of my current microwave is simply much stronger. Keeping this in mind, you may have to play around with the cook times for your own microwave, though I would recommend starting with six. 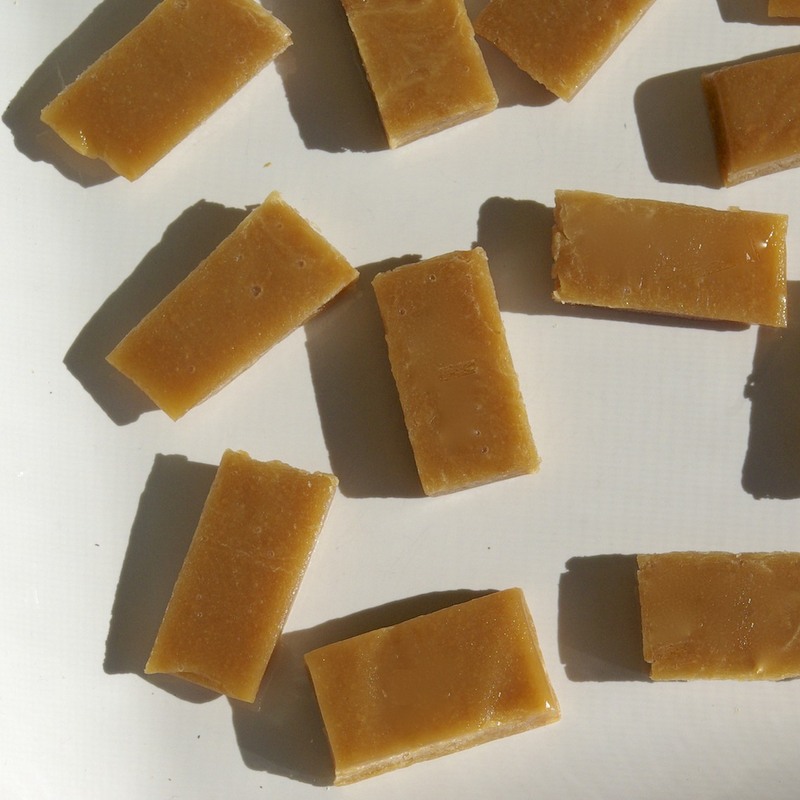 The beautiful thing is, you can make close to 10 batches in the time it usually takes to make one on the stove top, and the caramels taste delicious both chewy and firm. You cannot go wrong! Prepare an 8×8 baking dish lined with tin foil and sprayed well with non-stick cooking spray. In a 2 quart (or larger) microwave-safe bowl combine all ingredients and stir. Place bowl in microwave and cook on high power for 2 minutes; stir. Microwave caramels for an additional 2 minutes and stir thoroughly once again. Finally, microwave for an additional 1-3 minutes, (see note above about microwave temps) and stir very well until smooth. Transfer caramels to prepared baking dish, sprinkle with sea salt (if using) and place in fridge until firm enough to cut (about an hour). If you wanted harder caramels and cooked them longer, you may skip this step and simply wait for the caramels to cool before cutting them. Remove caramels from refrigerator, pull up sides of foil to remove caramels from dish and transfer to a cutting board. Remove foil. If caramels are too firm to cut, allow them to soften a bit at room temperature. Cut into desired size squares – I cut rows of 4×8. Wrap caramels in parchment paper squares and, if soft, store in an airtight container in your refrigerator. Otherwise store in an airtight container on your countertop. They look yummy! Happy birthday to your Dad! New appliances can be a surprise, I'm still trying to figure out the ins and outs of my oven. Thanks, and agreed! The fridge (weird) and microwave are my biggest problems. My fridge likes to freeze everything, no matter what I have the temp dial at. haha. I have not seen that recipe, but it sounds INCREDIBLE! I will have to check it out 🙂 Perhaps it could be ready in six minutes, too. How awesome would that be?? love this recipe! I changed a couple of things like less brown sugar and more butter! I tried another blog with microwave carmels and didn't like it at all. If you tweak this one to your taste you will love it too. Thanks Paula for sharing it with us!